Received August 2, 2018; Revised August 14, 2018; Accepted August 14, 2018. The Korean weedy rice, PBR (photoblastic rice) was reported to have light-inducible seed germination (photoblastism) and long mesocotyl. In previous studies, we mapped two QTL each for photoblastism and mesocotyl length using progeny from a cross between Ilpumbyeo and PBR. One F8 line CR7124 having photoblastism and long mesocotyl, was chosen and crossed to Ilpumbyeo to produce 95 F3 lines for QTL mapping. Germination percentage of CR7124 and Ilpumbyeo was 3.3 ± 2.4% and 91.7 ± 7.1%, respectively in the dark condition. 95 F3 lines ranged from 28.6% to 100% in germination. For mesocotyl, Ilpumbyeo and PBR elongated up to 1.5 mm and 18.5 mm, respectively whereas 95 F3 lines ranged from 0.9 mm to 16.3 mm. The mesocotyl length showed highly negative significant correlation with germination rate in dark condition (r = 0.70, P < 0.0001). QTL mapping using 95 F3 lines confirmed the linkage of two QTL for photoblastism and mesocotyl length on chromosome 1. Eight F4 lines with different PBR chromosome segments in the target region were used for substitution mapping of pbr1 and qMel-1. It appears that qMel-1 was located in the interval RM11252 - RM7419, a region of approximately 4.7 Mb. pbr1 was located in the interval between RM7202 and RM11729. Although further fine mapping of two QTL is necessary to know the relationship of these two traits, these results together with the highly significant correlation between two traits indicate that two QTL are linked. DNA markers linked to these QTLs would be useful in facilitating the selection of lines with enhanced mesocotyl elongation. Weedy rice has been used as genetic materials in the breeding program to improve traits of rice cultivars such as cold tolerance, seed dormancy, and disease resistance (Gu et al. 2004; Oh et al. 2004; Gu et al. 2011; Liu et al. 2015). Moreover, traits such as seed awn, red pericarp (or seed coat), seed shattering and seed longevity of weed rice were also studied for understanding the domestication of cultivated rice (Patry et al. 2001; Thurber et al. 2010; Subudhi et al. 2014). One of the Korean weedy rice, photoblastic rice (PBR) having a photoblastism and long mesocotyl compared to the cultivated rice, was reported (Chung and Paek 2003; Lee et al. 2012a). The photoblastism is defined as the light promotion of germination. In general, photoblastism has been observed in the small-seeded plants, like tobacco, Arabidopsis, and weeds and has not been found in crop seeds. (Simpson 1990; Milberg et al. 2000). Photoblastic seeds buried in soil depth, are triggered into germination from dormancy when the seed was exposed to light by soil disturbance (Wesson and Wareing 1969; Bewley and Black 1994; Scopel et al. 1994). Another trait of PBR, mesocotyl is defined as the organ between the coleoptile node and the point of union of the culm with the root. The mesocotyl of weedy or wild rice is longer than that of cultivated rice (Cai and Morishima 2002; Chung 2010; Eizenga et al. 2016). In cultivated rice, indica cultivars exhibit a longer mesocotyl than that of japonica cultivars (Takahashi 1978). The mesocotyl elongation showed important functions in seedling emergence when the seed was sown in soil depth (Alibu et al. 2012; Lu et al. 2016; Lee et al. 2017). The mesocotyl elongation has the function to elevate the coleoptile tip above the soil surface, where primary leaves emerged. When the coleoptile tip is exposed to light, the mesocotyl elongation stopped in maize (Inge and Loomis 1937; Vanderhoef and Briggs 1978). In rice, mesocotyl elongation is also affected by light in rice (Takahashi 1984; Nick and Furuya 1993). The only short light exposure for one minute inhibited the mesocotyl elongation in rice (Feng et al. 2017). A few studies have reported the genetic analysis of photoblastism and mesocotyl regulated by light in rice. (Lee et al. 2010). In previous studies, two QTL (pbr1 and pbr12) controlling photoblastism of PBR were mapped on chromosomes 1 and 2 using bulked segregant analysis (BSA) with two populations from crosses between japonica cultivars, Ilpumbyeo and PBR and, indica cultivars, Milyang23 and PBR (Lee et al. 2010). Several QTL studies were performed for mesocotyl elongation using segregation populations derived from interspecific or intrasubspecific crosses (Katsuta-Seki et al. 1996; Redoña and Mackill 1996; Cai and Morishima 2002; Cao et al. 2002; Huang et al. 2010; Lee et al. 2012b). In our previous study, two QTL (qMel-1 and qMel-3) were identified on chromosomes 1 and 3 using BSA with F7 and F8 lines developed from a cross between Ilpumbyeo and PBR (Lee et al. 2012a). Interestingly, the QTL pbr1 region was overlapped with qMel-1 near the simple sequence (SSR) marker, RM8260, on chromosome 1. The aims of this study were 1) to re-confirm two QTL controlling photoblastism, pbr1 and pbr12 using F8 population developed from a cross between Ilpumbyeo and PBR, 2) and to delimit the location of pbr1 and qMel-1 on chromosome 1 using substitution mapping to infer their possible linkage relationship. Seed of the weedy rice, PBR (photoblastic rice) and the japonica rice cultivar, Ilpumbyeo was used. The seed was obtained from the National Institute of Crop Science, Rural Development Administrain (RDA), Suweon, South Korea. A total of 120 F8 lines were developed from a cross between Ilpumbyeo and PBR. The population was derived from an F2 population with single seed descent. Parents and the lines were grown in the experiment field in Chungnam National University, South Korea. The seeds were harvested at about 60 days after heading. After harvesting, panicles were dried at the greenhouse for 40 days, and seeds of only upper 2/3 region of panicle were collected. Seeds for the evaluation of mesocotyl were dried at 50°C for 7 days to break dormancy. For QTL and substitution mapping of qMel-1 and pbr1, one F8 line CR7124 having photoblastism and long mesocotyl like PBR, was selected and backcrossed to Ilpumbyeo. From the F2 population, 95 plants were selected randomly and advanced to F3 lines for QTL analysis. For substitution mapping, 30 F3 lines were selected based on the genotype at pbr1 and pbr12 loci on chromosomes 1 and 12, respectively and advanced to F4 generation. For evaluation of mesocotyl length, 12 – 15 well ripened dry seeds of each line were selected and sown at <0.5 cm depth 0.3% agar medium in a plant culture jar (8 cm diameter, 11 cm height). Seeds planted in agar medium were incubated in complete dark condition at 30°C for 7 days. The mesocotyl length of each seedling was measured using a ruler as the distance from the basal part of the seminal root to the coleoptilar node. Seedlings showing poor growth were excluded. In light exposure experiment, the plant culture jar planted with seeds were incubated under the light condition for 1 day or 3 days after planting at 30°C, and then were immediately wrapped with two layers of aluminum foil. Wrapped jars were incubated under dark condition for 6 days or 4 days at 30°C, respectively. For evaluation of germination rate in light and dark condition, seeds dried at the greenhouse for 40 days were used. Two or three replicates of 25 – 30 grains were used for each germination test. Seeds were placed in a 6-well plastic cell culture plates containing 3 mL of distilled water. These culture plates were incubated under continuous white light and dark conditions in the growth chambers at 30°C, respectively. To maintain complete dark condition, the plates were wrapped with two layers of aluminum foil. At 4 days after imbibition, the seed with radicle or plumule at least 2 mm in size were counted as germinated seed. Genomic DNA was extracted from fresh leaves of each line by the method described in Causse et al. (1994). For genotyping, the polymerase chain reaction (PCR) with SSR markers and PCR products separation using polyacrylamide gel electrophoresis (PAGE) or MetaPhor agarose gel electrophoresis (Lonza Corp.) (Panaud et al. 1996) were performed. In PAGE, marker detection using the silver staining procedure were performed with the silver staining kits (Bioneer Corp.). In MetaPhor agarose gel electrophoresis, PCR products were stained with ethidium bromide. For QTL analysis in 120 F8 lines, 14 SSR markers on chromosomes 1, 3 and 12 were used. These markers were selected based on BSA and QTL results for mesocotyl length and photoblastism from the previous studies (McCouch et al. 2002; Lee et al. 2010; Lee et al. 2012a). The data of mesocotyl length, and difference in germination rate between dark and light condition were used for QTL analysis of 120 F8 lines. Information on linkage mapping and QTL analysis was provided in the previous studies (Lee et al. 2010; Lee et al. 2012b) The linear regression analysis and correlation analysis between germination rate and mesocotyl length, was performed using Microsoft Excel Program (Microsoft Co.). To determine the association between RM7419 genotype with germination rate and mesocotyl length in 95 F3 lines, one-way ANOVA was performed using Minitab software (Minitab Inc.). Association of germination rate with SSR marker genotype near the QTL pbr12 was detected using 30 F4 lines. Mean comparisons among F4 lines in substitution mapping were made using the Fisher’s LSD test in Minitab software (Minitab Inc.). PBR showed photoblastism and long mesocotyl compared to the japonica cultivar, Ilpumbyeo (Fig. 1A). PBR scored 12.7 ± 3.1% in germination with Ilpumbyeo of 90.0 ± 4.1% in the dark condition, whereas both PBR and Ilpumbyeo achieved over 98.0% of germination rate in light condition indicating that the germination of PBR seed was strongly induced by light. Mesocotyl elongation was also reported to be inhibited when the seedlings are exposed to the light. In order to know whether mesocotyl elongation was inhibited by light, the light exposure experiments were conducted (Fig. 1B). Dormancy-broken seeds of PBR and Ilpumbyeo were sown in agar media and incubated for 7 days in the dark condition. In the light exposure experiment, seeds were exposed to the light for 1 day or 3 days after sowing (DAS) and then were grown in dark for another 6 and 4 days, respectively. PBR mesocotyl of 7 DAS in the dark condition was 14.8 ± 4.1 mm long whereas it reached 9.3 ± 4.2 mm and 1.4 ± 1.4 mm in 1-day and 3-days light exposure condition, respectively. 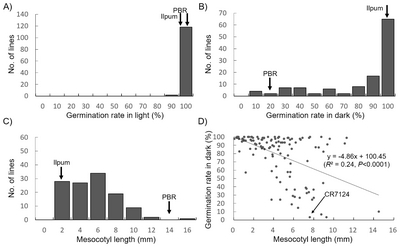 Mesocotyl length decreased in proportion to the duration of the light exposure in both PBR and Ilpumbyeo (Fig. 1B). These results suggest that the light is related to the mesocotyl elongation as well as the photoblastism of PBR. For genetic analysis of photoblastism and mesocotyl elongation, 120 F8 lines were investigated for photoblastism and mesocotyl length (Fig. 2). The germination rate and mesocotyl length of F8 lines were independently investigated with three replicates. The germination rate of parental lines, Ilpumbyeo and PBR, was over 98% and F8 lines ranged from 83% to 100% at 30°C with the light (Fig. 2A) indicating that the dormancy of F8 seeds were broken. On the other hand, the germination rate in dark condition was significantly different between parents. The germination rate of PBR and Ilpumbyeo were 15.0 ± 2.4% and 91.7 ± 7.1%, respectively. The germination rate in the dark of F8 lines ranged from 3.3% to 100% with a continuous variation with a few transgressive lines to PBR side (Fig. 2B). A peak was observed in the interval over 90%. These results are consistent with previous reports using an F4 lines (Lee et al. 2010). The mesocotyl length of F8 lines was already reported in Lee et al. (2012a) (Fig. 2C). The germination rate and mesocotyl length in dark condition of 120 F8 lines were significantly correlated (r = −0.49, P < 0.0001), indicating the presence of relationship between two traits. In the previous study, QTLs controlling mesocotyl length, qMel-1 and qMel-3 were detected on chromosomes 1 and 3, respectively (Table 1) (Lee et al. 2012a). QTLs controlling photoblastism of PBR, pbr1 and pbr12 were also detected on chromosomes 1 and 12, respectively (Lee et al. 2010). In this study, QTLs, pbr1 and pbr12 were reconfirmed using more advanced 120 F8 lines in the interval from RM580 to RM8260 on chromosome 1 and from RM3226 to RM6953 on chromosome 12, respectively (Table 1). The phenotypic variance explained by pbr1 and pbr12 was 7.6% and 13.7%, respectively. To know whether the two QTL, qMel-1 and pbr1 are colocalized, one line, CR7124 showing photoblastism and long mesocotyl was selected among 120 F8 lines (Fig. 2). Marker analysis indicated that CR7124 did not possess the qMel-3 QTL but harbor the QTL, pbr12. Germination percentage of CR7124 was 83.3 ± 9.4% and 3.3 ± 2.4% in the light and dark condition, respectively and it revealed long mesocotyl with 7.6 ± 0.7mm. 95 F3 lines derived from a cross between CR7124 and Ilpumbyeo ranged from 88.2% to 100% in the germination percentage in light condition (Data not shown). In dark condition, the germination rate ranged from 28.6% to 100% with a strong peak in the interval between 90 and 100% (Fig. 3A). For mesocotyl, Ilpumbyeo and PBR were elongated up to 1.5 mm and 18.5 mm, respectively whereas the mesocotyl length of 95 F3 lines ranged from 0.9 mm to 16.3 mm (Fig. 3B). Mesocotyl length of 95 F3 lines showed a nearly normal and skewed distribution towards PBR type. For mapping QTL, 95 F3 lines were genotyped with a nearest SSR marker, RM7419 on chromosome 1 (Figs. 3 and 4). RM7419 explained 15.5% and 35.5% of the phenotypic variance for photoblastism and mesocotyl length, respectively (Fig. 3, Table 2). Compared with the QTL results of F8, qMel-1 at RM8260-RM7419 on chromosome 1 is considered to be a major QTL that explained 35.5% of the phenotype variance in mesocotyl length (Tables 1 and 2). Using 30 F4 plants, pbr1 and qMel-1 was detected same region on RM8260-RM11729 (Table 2). ANOVA was conducted to know association between photoblastism and the pbr12 QTL. To exclude the possibility of interaction between pbr1 and pbr12, 12 F4 lines with the pbr1 QTL were selected and analyzed. The results revealed that the pbr12 QTL near RM6953-RM28758 explained 38.8% of the phenotypic variation for photoblastism (P <0.01, Table 2). For substitution mapping of pbr1 and qMel-1, 8 F4 lines with different PBR segments within the region defined by SSR markers RM580 and RM11729 on chromosome 1, were selected and used (Fig. 4). Mesocotyl of two parental lines, PBR and Ilpumbyeo elongated up to 21.9 ± 5.2 mm and 2.5 ± 0.5 mm, respectively. Six lines (line-1 to line-6) revealed significantly longer mesocotyl than Ilpumbyeo, line-7, and line-8. Based on the genotype of these 8 lines, it was concluded that qMel-1 was located in the interval RM11252-RM7419, a region of approximately 4.7 Mb (Fig. 4). For pbr1 mapping, the germination rate was investigated in light and dark condition. The germination rate of Ilpumbyeo, PBR and 8 F4 lines were over 93% in light condition. In the dark condition, the germination rate of PBR was 29.5 ± 3.9 %, and those of three lines, line-1, lines-2, and line-3 were below 43.3% and not significantly different from PBR. The other 5 lines (line-4 to line-8) showed over 78.6 % of germination rate in dark condition. These 5 lines showing high germination rate in dark had no PBR segment in the downstream region from the breakpoint between RM7202 and RM7418 except line-6 which is PBR homozygous at the downstream region from the breakpoint between RM11252 and RM8260 (Fig. 4). To investigate the possible effect of another QTL pbr12 on germination in line-6, the pbr12 genotype of line-6 was determined. In the 5.02-Mb pbr12 region defined by markers from RM5448 to RM5310 on chromosome 12, 3 lines (line-1, -2 and -3) with low germination rate were PBR homozygous. And line-6 with high germination rate as the other 5 lines in dark was Ilpumbyeo homozygous. This result implies that pbr1 interacts with pbr12 in controlling the photoblastism in PBR. Based on the genotypes, it was concluded that pbr1 was located in the interval between RM7202 and downstream of RM11729. PBR displayed photoblastism as well as long mesocotyl. The PBR scored 12.7 ± 3.1% in germination with Ilpumbyeo of 90.0 ± 4.1% in the dark condition, whereas both PBR and Ilpumbyeo show over 98.0% of seed germination rate under light condition indicating that light is involved in the germination process of PBR seed (Lee et al. 2010). The negative effects of light on mesocotyl elongation was reported in oat and maize (Inge and Loomis 1937; Vanderhoef and Briggs 1978). In rice, mesocotyl elongation is also affected by light (Takahashi 1984; Nick and Furuya 1993). Nick and Furuya (1993) showed that gibberellin promotes and red light inhibits mesocotyl elongation in rice, by controlling microtubule of mesocotyl epidermis. Mesocotyl length of PBR exposed to light for 1-day and 3-days was decreased to 9.3 mm and 1.4 mm, compared to 14.8 mm incubated for 7 days in dark condition (Fig 1). Feng et al. (2017) also reported that the short light exposure for 1 minute could decrease mesocotyl length. The photoblastism and mesocotyl affected by light are presumed to be the survival strategy of PBR. The photosensitive seeds can maintain dormancy by sensing light until it is under the suitable condition, like shallow soil depth or avoiding leaf shade. The seedlings cannot sufficiently photosynthesize if seed germinates under the soil depth or leaf shade. Seed germination of various herbaceous species having photoblastism were inhibited under the leaf canopy giving preponderance of far red light than non-photoblastic seeds (Górski et al. 1977). This photosensitivity can be lost during burial (Bewley and Black 1994). The seed germinated in soil depth can promote seedling emergence by mesocotyl elongation (Lee et al. 2017). Therefore, it is assumed that photoblastism and mesocotyl of PBR help the seed to survive in the adverse condition. QTL mapping revealed that at least two QTL are associated with the variation for photoblastism and mesocotyl elongation in PBR (Lee et al. 2010; Lee et al. 2012a). QTLs, pbr1 and pbr12, were redetected using more advanced 120 F8 lines in the interval from RM580 to RM8260 on chromosome 1 and from RM3226 to RM6953 on chromosome 12, respectively (Table 1). Interestingly, the locus of pbr1 and qMel-1 were overlapped at RM8260 on chromosome 1. This result supports the previous significance relationship between photoblastism and mesocotyl length (r = −0.49 P < 0.0001) and indicates that two QTL are linked (Fig. 2D). Moreover, QTL for mesocotyl elongation was commonly mapped to chromosome 1 in different mapping populations and experiment conditions (Katsuta-Seki et al. 1996; Redoña and Mackill 1996; Cai and Morishima 2002; Cao et al. 2002; Lee et al. 2012b; Zhang et al. 2012). To better define the position of pbr1 and qMel-1, substitution mapping was conducted using F4 lines (Fig. 4). pbr1 was located in the interval RM7202-RM11729, a region of approximately 6.5Mb and, qMel-1 in the interval between RM11252-RM7419 which are approximately 4.7-Mb away. The six lines with different PBR chromosome segments on qMel-1, had significantly shorter mesocotyl than PBR (Fig. 4). This result implies that qMel-1 should be combined with qMel-3 to have mesocotyl elongation as PBR. It is implied that pbr1 interacts with pbr12 in controlling the photoblastism in PBR. ANOVA analysis indicated that pbr12 alone explained 38.8% of the phenotypic variance for photoblastism using 12 F4 lines harboring PBR homozygous segment at pbr1 (R2 = 38.8%, P < 0.05). In addition to photoblastism and long mesocotyl, PBR plants exhibited a taller stature relative to Ilpumbyeo. QTL mapping using 95 F3 lines revealed an association between culm length and a marker genotype at RM7202-RM7419 (R2 = 6.6%, P < 0.05). The semidwafing gene, sd-1 is located 5.7Mb from RM11729 on chromosome 1. The sd-1 encodes gibberellin 20-oxidase (GA20ox2), the key enzyme in gibberellins biosynthesis pathway (Monna et al. 2002; Spielmeyer et al. 2002). In previous report, the relation between mesocotyl length and plant height was investigated using semidwarf rice and two traits might be controlled by sd-1 gene (Diday et al. 1990; Murai et al. 1995). However, our results suggest that sd-1 gene is not the same gene as qMel-1 in controlling mesocotyl elongation but linked to qMel-1. Exotic QTL alleles that are favorable for some traits may be associated with deleterious effects on other traits (Xiao et al. 1998). In this research, PBR alleles in the target region on chromosome 1 had a favorable effect on mesocotyl elongation, while at the same time, PBR alleles in this region were responsible for photoblastism and increased plant height mainly due to the SD1 gene. Increased plant height without a simultaneous increase in stem thickness makes rice plants more susceptible to lodging, leading indirectly to yield loss. It is not clear whether these traits especially SD1 and photoblastism are under the control of common genetic factor or independent linked genes. Because SD1 and qMel-1 is linked, rice breeders who wish to take advantage of long mesocotyl QTL allele suited for direct seeding from PBR might employ linked DNA markers linked to qMel-1 in selecting for the qMel-1 gene in the progeny because evaluating mesocotyl elongation is time-consuming and is affected by environmental factors. It will be of great interest to understand what gene(s) underlies these QTL and how they interact with alleles at other loci to generate variation for agronomical important phenotypes from weedy rice accessions. This work was carried out with the support of “Cooperative Research Program for Agriculture Science and Technology Development (Project No. PJ01321401)” Rural Development Administration, Republic of Korea. Fig. 1. Comparison of germination rate between two parental lines in the light and dark condition (A) and mesocotyl length for three different light exposure experiment (B). Fig. 2. Distribution of germination rate in light (A), in dark (B), mesocotyl length (C) and relationship between two traits in the 120 F8 lines (D) (). Arrowheads indicate mean values for Ilpumbyeo and PBR. Linear regression analysis between two traits was performed. Fig. 3. Frequency distribution of the germination rate in dark condition (A) and the mesocotyl length (B) of 95 F3 lines derived from a cross between CR7124 and Ilpumbyeo. Arrows indicated the average of Ilpumbyeo and PBR. White, black and gray bars indicate homozygous for Ilpumbyeo and PBR alleles and heterozygous for the marker RM7419 on chromosome 1. The proportion of the phenotypic variance (R2) is indicated in each figure (P < 0.0001). Fig. 4. Graphical genotypes of 8 F3 lines used in substitution mapping of qMel-1 and pbr1. White, black and gray bars indicate homozygous for Ilpumbyeo and PBR alleles and heterozygous, and slashed areas indicates regions where crossing-over occurred on chromosome 1. The figure to the right of the graphical genotypes indicates mean of mesocotyl length and germination rate in dark condition for each 8 F4 lines derived from a cross between CR7124 and Ilpumbyeo. Bars represent mean of length with SE. Means with different letters in the same row indicate significant difference according to the Fisher’s LSD test (P < 0.05). Characteristics of QTLs for photoblastism and mesocotyl length detected on chromosomes 1, 3, and 12 using 120 F8 lines developed from a cross between Ilpumbyeo and PBR. QTLs were designated as “pbr chromosome number” and “qMel-chromosome number” for photoblastism and mesocotyl length, respectively. The nearest SSR marker to the QTL is underlined. Putative QTLs with LOD score greater than 3.0. Proportion of the phenotypic variation explained by the nearest marker of QTL. Estimated effect of replacing Ilpumbyeo alleles by PBR alleles. Characteristics of QTLs for photoblastism and mesocotyl length detected on chromosomes 1 and 12 based on one-way ANOVA in 95 F3 lines and 30 F4 line. The nearest SSR marker to both pbr1 and qMel-1. Proportion of the phenotypic variation explained by the nearest marker. II, IP, and PP indicated the genotypic group of Ilpumbyeo homozygote, heterozygote, and PBR homozygote, respectively. Number in ( ) indicated the number of F3 and F4 lines in each genotypic group. Alibu, S, Saito, Y, Shiwachi, H, and Irie, K (2012). Genotypic variation in coleoptile or mesocotyl lengths of upland rice (Oryza sativa L.) and seedling emergence in deep sowing. Afr J Agric Res. 7, 6239-6248. Cai, W, and Morishima, H (2002). QTL clusters reflect character associations in wild and cultivated rice. Theor Appl Genet. 104, 1217-1228. Cao, L, Zhu, J, Yan, Q, He, L, Wei, X, and Cheng, S (2002). Mapping QTLs with epistasis for mesocotyl length in a DH population from indica-japonica cross of rice (Oryza sativa). Chinese J Rice Sci. 16, 221-224. Causse, MA, Fulton, TM, Cho, YG, Ahn, SN, Chunwongse, J, and Wu, K (1994). Saturated molecular map of the rice genome based on an interspecific backcross population. Genetics. 138, 1251-1274. Chung, NJ, and Paek, NC (2003). SEED: Photoblastism and ecophysiology of seed germination in weedy rice. Agronomy J. 95, 184-190. Chung, NJ (2010). Elongation habit of mesocotyls and coleoptiles in weedy rice with high emergence ability in direct-seeding on dry paddy fields. Crop Pas Sci. 61, 911-917. Dilday, RH, Mgonja, MA, Amonsilpa, SA, Collins, FC, and Wells, BR (1990). Plant height vs. mesocotyl and coleoptile elongation in rice: Linkage or pleiotropism?. Crop Sci. 30, 815-818. Eizenga, GC, Neves, PCF, Bryant, RJ, Agrama, HA, and Mackill, DJ (2016). Evaluation of a M-202 × Oryza nivara advanced backcross mapping population for seedling vigor, yield components and quality. Euphytica. 208, 157-171. Feng, F, Mei, H, Fan, P, Li, Y, Xu, X, and Wei, H (Array). Dynamic transcriptome and phytohormone profiling along the time of light exposure in the mesocotyl of rice seedling. Sci Rep. 7, 1. Górski, T, Górska, K, and Nowicki, J (1977). Germination of seeds of various herbaceous specie under leaf canopy. Flora. 166, 249-259. Gu, X-Y, Kianian, SF, and Foley, ME (2004). Multiple loci and epistasis control genetic variation for seed dormancy in weedy rice (Oryza sativa). Genetics. 166, 1503-1516. Gu, X-Y, Foley, ME, Horvath, DP, Anderson, JV, Feng, J, and Zhang, L (2011). Association between seed dormancy and pericarp color Is controlled by a pleiotropic gene that regulates ABA and flavonoid synthesis in weedy red rice. Genetics. 189, 1515-1524. Huang, C, Jiang, S-K, Feng, L-L, Xu, Z-J, and Chen, WF (2010). Analysis of QTLs for mesocotyl length in rice (Oryza sativa L.). Acta Agron Sin. 36, 1108-1113. Inge, FD, and Loomis, WE (1937). Growth of the first internode of the epicotyl in maize seedlings. Amer Jour Bot. 24, 542-547. Katsuta-Seki, M, Ebana, K, and Okuno, K (1996). QTL analysis for mesocotyl elongation in rice. Rice Genet News. 13, 126. Lee, HS, Ahn, SN, Sasaki, K, Chun, NJ, Choi, KS, and Sato, T (2010). Identification of molecular markers for photoblastism in weedy rice. Korean J Breed Sci. 42, 144-150. Lee, H-S, Kang, J-W, Chung, N-J, Choi, K-S, and Ahn, SN (2012a). Identification of molecular markers for mesocotyl elongation in weedy rice. Korean J Breed Sci. 44, 238-244. Lee, H-S, Sasaki, K, Higashitani, A, Ahn, S-N, and Sato, T (2012b). Mapping and characterization of quantitative trait loci for mesocotyl elongation in rice (Oryza sativa L.). Rice. 5, 13. Lee, H-S, Sasaki, K, Kang, J-W, Sato, T, Song, W-Y, and Ahn, S-N (2017). Mesocotyl elongation is essential for seedling emergence under deep-seeding condition in rice. Rice. 10, 32. Liu, Y, Qi, X, Gealy, DR, Olsen, KM, Caicedo, AL, and Jia, Y (2015). QTL analysis for resistance to blast disease in U.S weedy rice. Mol Plant-Microbe Interact. 28, 834-844. Lu, Q, Zhang, M, Niu, X, Wang, C, Xu, Q, and Feng, Y (2016). Uncovering novel loci for mesocotyl elongation and shoot length in indica rice through genome-wide association mapping. Planta. 243, 645-657. Monna, L, Kitazawa, N, Yoshino, R, Suzuki, J, Masuda, H, and Maehara, Y (2002). Positional cloning of rice semidwarfing gene, sd-1: rice “green revolution gene” encodes a mutant enzyme involved in gibberellins synthesis. DNA Res. 9, 11-17. McCouch, SR, Teytelman, L, Xu, Y, Lobos, KB, Clare, K, and Walton, M (2002). Development and mapping of 2240 new SSR markers for rice (Oryza sativa L.). DNA Res. 9, 199-207. Milberg, P, Andersson, L, and Thompson, K (2000). Large-seeded species are less dependent on light for germination than small-seeded ones. Seed Sci Res. 10, 99-104. Murai, M, Sato, S, Ise, K, and Semihira, Y (1995). Effects of the dwarfing gene from Dee-geo-woo-gen and others on emergence ability under deep seeding condition in rice. Breed Sci. 45, 163-171. Nick, P, and Furuya, M (1993). Phytochrome dependent decrease of gibberellin sensitivity; a case study of cell extension growth in the mesocotyl of japonica and indica type rice cultivars. Plant Growth Regul. 12, 195-206. Oh, CS, Choi, YH, Lee, SJ, Yoon, DB, Moon, HP, and Ahn, SN (2004). Mapping of quantitative trait loci for cold tolerance in weedy rice. Breed Sci. 54, 373-380. Panaud, O, Chen, X, and McCouch, SR (1996). Development of microsatellite markers and characterization of simple sequence length polymorphism (SSLP) in rice (Oryza sativa L.). Mol Gen Genet. 252, 597-607. Patry, CB, Lorieux, M, Clement, G, Bangratz, M, and Ghesquiere, A (2001). Heredity and genetic mapping of domestication-related traits in a temperate japonica weedy rice. Theor Appl Genet. 102, 118-126. Redoña, ED, and Mackill, DJ (1996). Mapping quantitative trait loci for seedling vigor in rice using RFLPs. Theor Appl Genet. 92, 395-402. Scopel, AL, Ballare, CL, and Radosevich, SR (1994). Photostimulation of seed germination during soil tillage. New Phytol. 126, 145-152. Spielmeyer, W, Ellis, MH, and Chandler, PM (2002). Semidwaf (sd-1), “green revolution” rice, contains a defective gibberellins 20-oxidase gene. Proc Natl Acad Sci USA. 99, 9043-9048. Subudhi, PK, Singh, PK, Deleon, T, Parco, A, Karan, R, and Biradar, H (2014). Mapping of seed shattering loci provides insights into origin of weedy rice and rice domestication. J Hered. 105, 276-287. Takahashi, N (1978). Adaptive importance of mesocotyl and coleoptile growth in rice under different moisture regimes. Aust J Plant Physiol. 5, 511-517. Thurber, CS, Reagon, M, Gross, BL, Olsen, KM, Jia, Y, and Caicedo, AL (2010). Molecular evolution of shattering loci in U.S. weedy rice. Mol Ecol. 19, 3271-3284. Vanderhoef, LN, and Briggs, WR (1978). Red light-inhibited mesocotyl elongation in maize seedlings: I. The auxin hypothesis. Plant Physiol. 61, 534-537. Wesson, G, and Wareing, PF (1969). The induction of light sensitivity in weed seeds by burial. J Exp Bot. 20, 414-425. Xiao, J, Li, J, Grandillo, S, Ahn, SN, Yuan, L, and Tanksley, SD (1998). Identification of trait-improving quantitative trait loci alleles from a wild rice relative, Oryza rufipogon. Genetics. 150, 899-909. Zhang, H, Ma, P, Zhao, Z, Zhao, G, Tian, B, and Wang, J (2012). Mapping QTL controlling maize deep-seeding tolerance-related traits and confirmation of a major QTL for mesocotyl length. Theor Appl Genet. 124, 223-232.